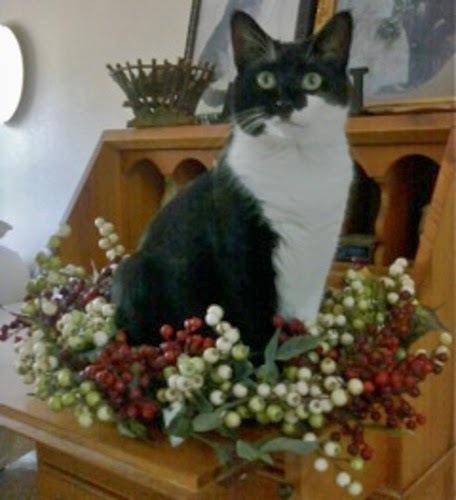 The Monday after Christmas, Karen S. was driving North on IH 35 to her office in Round Rock just before 8 a.m. when something caught her attention: huddled against the concrete wall that separates the south bound from the north bound lane, she spotted a small black and white cat. There was no place for Karen to stop in the morning traffic, so as soon as Karen exited the highway, she called 311. She was told rudely that no one was going to go get a cat on IH35. She then tried to reach Animal Control in Round Rock and was transferred numerous times, without any success. Meanwhile, Frank and Jean A. were driving North on IH35, when they saw something that looked like a cat in the median against the concrete wall. Frank looked in the rear view mirror and saw two black ears. "Let's turn around," he said to his wife. They did, and as they drove by the cat a second time, she looked up and Frank saw her eyes. "She is alive," he said to Jean. They decided to exit the highway and look for a police car that could stop the traffic and allow them to pick up the cat. They did not find a police car, but a fire truck was stationed nearby, and they found a receptive ear in the fire crew. Soon the firemen were on their way to rescue the hapless cat, which they delivered to Frank and Jean who proceeded to take her to the nearest emergency clinic. The cat was found to have a microchip registered to Cats' Angels. As soon as I was contacted, I arranged for the cat to be taken to our vet clinic. The X-rays did not reveal any bone fracture, but the area at the base of the tail had severe trauma. I was able to identify the cat through our computer files and found that her family lived in Spicewood, one and a half hour away from where the cat was found. How did Miss Tippy get from Spicewood to IH 35 in Round Rock? Her family had last seen her on Christmas day and had no idea how she could have gotten there. Miss Tippy's family kept her as an outside cat, a dangerous situation. Meanwhile, the stars were aligned for Miss Tippy after her heroic rescue. Upon learning that she was registered to a cat rescue organization, Karen offered to adopt her. Miss Tippy could not return to be an outside cat, so I welcomed Karen's request and asked her to work with me in transitioning Tippy to become an inside cat. Karen agreed. Miss Tippy now has a wonderful home. The moral of the story is that there are cats angels everywhere who will go out of their way to rescue an injured animal. I can't thank Karen, Frank and Jean, and the Round Rock fire crew enough for their selfless actions to save Tippy's life. It is a Christmas miracle. Update on Miss Tippy: The damage on her spine at the base of the tail was such that it had to be an amputated. Miss Tippy looks different without her tail, but it doesn't affect her quality of life. She is in every other ways a very lucky kitty.